Currently the labor force is at 155.013M. 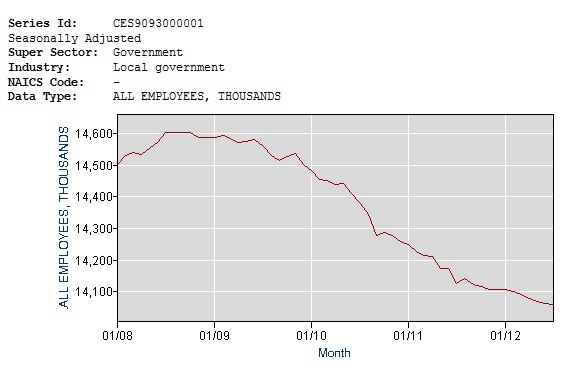 Therefore the contraction of 1.069M government jobs equates to 0.7% of the labor force. One could conclude that these lost jobs add to the rolls of the unemployed. If you consider population growth the impact is higher. From May 2010 to July 2012 the population grew about 2%. 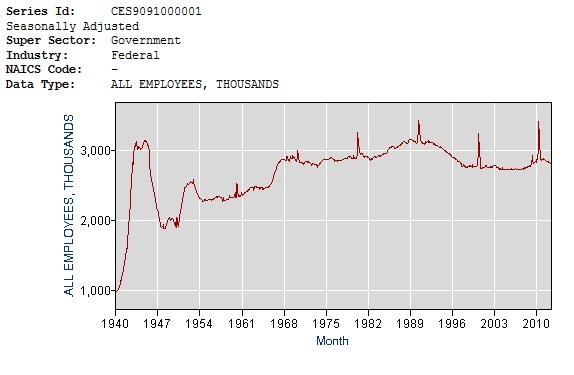 If government employment had grown along with the population then it would be at 22.997M x 1.02 = 23.45694M. Thats 1.52894M fewer jobs than we have currently. This amount is about 1% of the labor force. I am not trying to draw any conclusions from this and I don't have a point here. 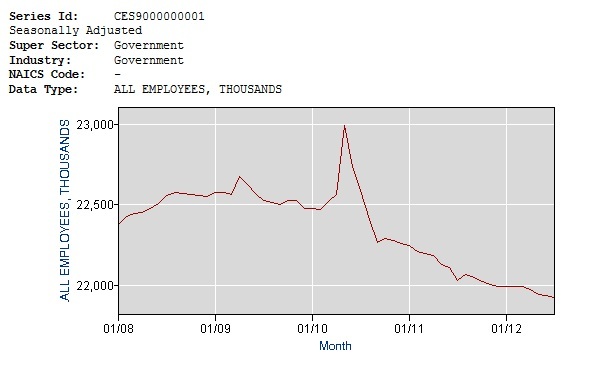 I just thought it was interesting that the number of government jobs has shrunk that much in the past couple years. I'm not sure of the exact cause but I'd assume its belt tightening but could also be due to some demographic shifts. 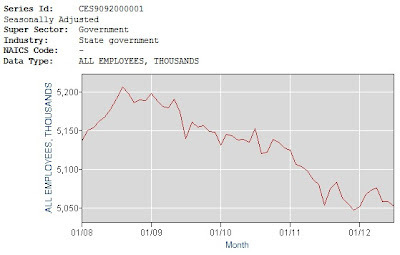 Notice that big spike in jobs in 2010? Yeah that sticks out. Its about 500k leap there in jobs for just a short period. Odd huh? I'll discuss that more after looking at the rest of the charts. Overall the number of federal jobs has not changed radically since 2010. 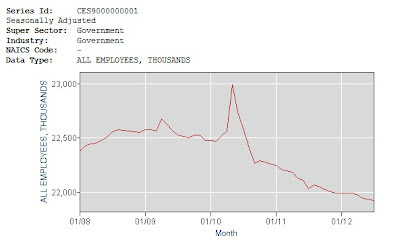 But you can see that spike is again shown here in the federal government employment rolls. 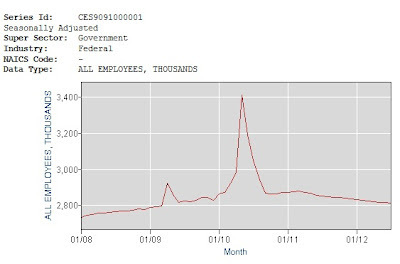 Federal jobs went up about 600k briefly in 2010. I suspect that this is large part due to employment in the military. Particularly given the huge spike in jobs in the 1940's. 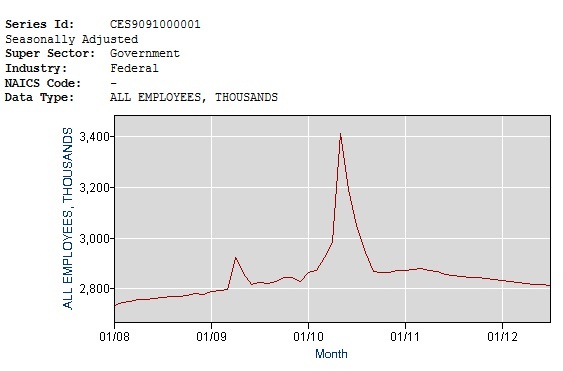 From that longer term graph of federal jobs you can also notice those short term spikes in employment every 10 years. 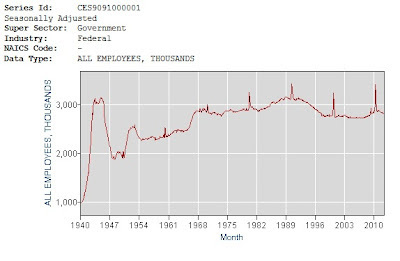 I assume those spokes in employment including the jump in 2010 is due to the US Census hiring temporary workers every 10 years to conduct the Decennial Census. 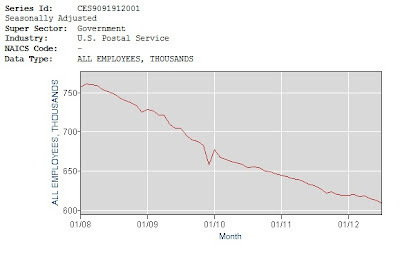 The USPS has been shedding workers pretty quickly for a few years now. 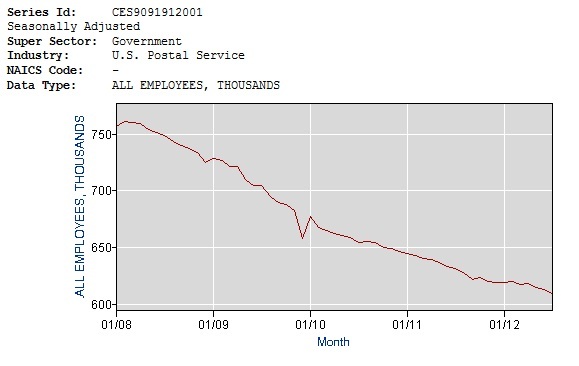 Total employment at USPS peaked at about 900k in April 1999 and has dropped about 1/3 to 609k as of July 2012. Thats about a -3% annual drop over 13 years. They've lost about 18% in just the past 4 years. 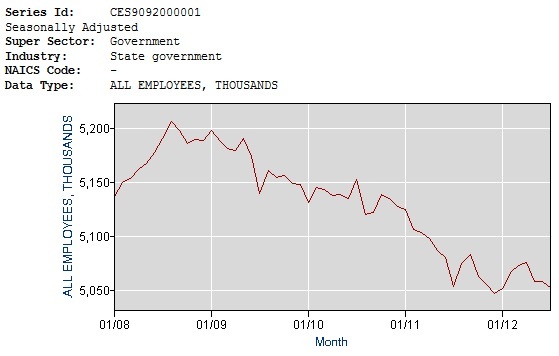 State governments as a whole have shed about 150k jobs, just a 2.8% drop. Local governments have lost about 500k jobs since 2009 which is about 3.5% cut.